When I first saw the trailer for The Boxtrolls it of course reminded me of Coraline. Makes sense, it’s a film done by the same company, Laika, a team that specializes in stop-motion animation. It’s a style that takes years of pain-staking work, so they’ve only ever produced three movies; Coraline (2009), ParaNorman (2012), and The Boxtrolls (2014). Their next project will be Wildwood, a creepy young adult story about a kidnapping, an adventure, and a rescue. Sounds cool and should be, if it’s anything like the other movies created by this company. Going back to the film at hand, I thought it looked a bit less dark & a tad more silly than I perhaps wanted, aimed at a younger audience. I was prepared to like it less than Coraline if those assumptions held true. And in a way they did, but that didn’t detract from an excellent story amazingly animated, culminating in a film that is undoubtedly the best work that Laika has ever completed. In the town of Cheesebridge, the humans that live there love two things: their children & their cheese. 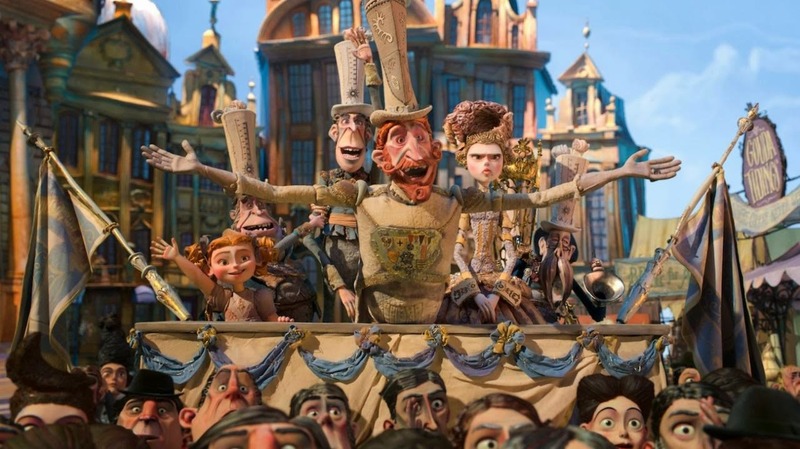 When the mischievous race of Boxtrolls who live underground are accused of stealing a child & plotting to steal the city’s cheese, the whole populace bands together in hate & loathing. A curfew is set, a group of exterminators are hired, and a war is waged on these evil, monsterous, kidnapping creatures. 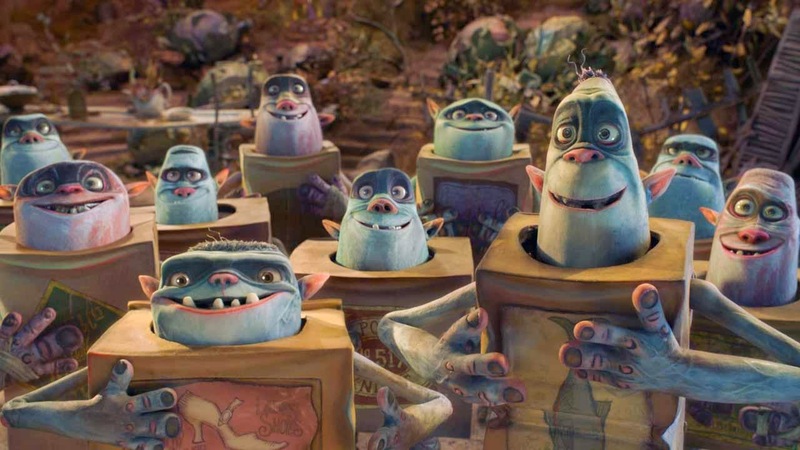 But the Boxtrolls have been completely misunderstood. All they want is the junk that humans discard out of hand, the gadgets that we throw away but that the inventive little trolls just love. And the little boy that they were said to have stolen in order to eat is alive and well, an adopted Boxtroll who now sees the silly race as his family. Going by the name Eggs, this boy will find himself in the middle of a struggle he’s not prepared for, a battle that the exterminators are sure to win. Can he find help on the surface, or will his underground home be completely destroyed? The visual side of this film is beyond excellent. It’s animation that looks completely real, and of course it is. These are figures that are moved miniscule amounts before every shot, faces that are physically contorted into expressions that come across as complicated emotions. And the action, the mechanics, the speed of movement; how they created & captured it is beyond understanding. It’s an impressive process that produces a stunning visual, a much more appreciated & comfortable viewing experience than movies like Tangled or Frozen. I don’t know what kids think, perhaps they like the new standard of computer animation better, but for my money I enjoy this throwback to the old style, this process that takes both amazing talent and a boat load of time. And it’s not just pleasing to the eye, the film isn’t just about the stop-motion. The story is complex, it’s entertaining, fun, heart-warming, and captivating. The characters are well thought out, multifaceted, and likeable. The movement & action are exciting, attention-grabbing, darkly amusing. It’s a movie that holds you in many different ways and doesn’t let you go, not even during the credits. I was right is assuming it’d be a little more silly, a bit less dark. But neither of those things were bad. There was a humor that all ages can enjoy and a slight retreat from the grim. There was still plenty of pain & black comedy, but it wasn’t as oppressive as Coraline was at times. A lighter feel prevailed, with many breaks for laughs, but still somehow holding on to an emotionally charged plot that never released its grip on the audience. The Boxtrolls is the best animated movie I’ve seen in some time, a film that takes its time, adds in quality music, a Monty Python feel, a score of strong characters, and a story that is originally & singularly entertaining.